Death:OK (Let’s Talk About It) is a day of inspiration, information, and connection taking place October 17, 2015 on the campus of Reed College in Portland, Oregon. 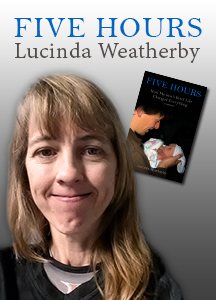 Lucinda will be presenting “Talking Openly about Infant Death.” She will share the story of her newborn son’s death and facilitate a discussion about supporting grieving families through their experiences. The session will include a 15 minute video telling her son’s story, question answer and small group breakout discussion, and grief show-and-tell items to pass around. The presentation will be framed with a simple grief ritual participants are welcome to take part in. The Hearth Community is a new model of community building based on personal storytelling, reflective listening, and community service. The Hearth Community develops community gatherings in which people explore, craft, and share stories from what they have lived. Lucinda will speaking at The Hearth on October 29th at 7pm. The address of the event is 1800 E Main street, Ashland, OR 97520. Bloomsbury Books is an independent bookstore in Ashland, Oregon specializing in contemporary fiction, children’s books, young adult, and local authors with a large Shakespeare and theater section. Lucinda will speaking at Bloomsbury Books on November 16th at 7pm. The address of the event is 290 E. Main street, Ashland, OR 97520. Lucinda will speaking at the Ashland Library on December 6th at 1pm. The address of the event is 410 Siskiyou Blvd. Ashland, OR 97520.